France, Germany and the UK have launched a drive for new global rules to clamp down on corporate tax avoidance. The three are seeking backing from others at a G20 meeting in Moscow. A survey carried out by the OECD found that multinational firms could exploit gaps between tax rules in the different countries in which they operate. Meanwhile, a leaked draft communiqué indicated G20 finance ministers would not chide Japan for weakening the yen. The finance ministers of France, Germany and the UK – Pierre Moscovici, Wolfgang Schaeuble and George Osborne – said international action was needed to crack down on companies which transfer profits from their home country to another in order to pay lower taxes. George Osborne decried a global taxation system he said had been guided by principles set out by the League of Nations in the 1920s, with few changes since. Pierre Moscovici said France was “strongly determined to fight against tax fraud, tax avoidance, and tax evasion”. A number of companies, including Amazon, Google and Starbucks, have come under the spotlight for their taxation strategies in recent months. Another giant international company, Facebook, has now been accused of ducking its tax obligations. Facebook allegedly paid no corporate income tax in the US last year, and instead reclaimed $451 million in taxes from the Internal Revenue Service, despite recording profits of over $1 billion, US lobby group Citizens for Tax Justice has claimed. Thanks to tax deductions the social network can claim on stock options granted to its executives as part of its recent listing on the Nasdaq stock exchange, the company stands to benefit from a further $2 billion of tax deductions in the future, the lobby group alleged. The OECD is also preparing a plan of action, which is to be laid before the G20 in July, assuming that the Moscow meeting gives this plan its blessing. The action plan will be formulated with the help of three committees. The UK will chair a committee looking at transfer pricing – how international corporate empires calculate the payments passed between their subsidiaries in different countries, which can be used to shift profits from high-tax jurisdictions to lower-tax ones. Germany will head a panel looking at the ways in which companies have reduced their tax base – their taxable income and assets – while France and the US will jointly consider the problem of identifying the correct tax jurisdiction for business activities, particularly e-commerce. 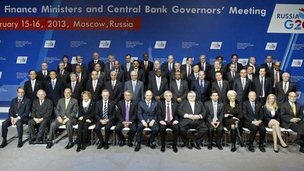 Meanwhile, the G20 finance ministers in Moscow are expected to avoid singling Japan out for criticism over recent weakness of its currency, a leaked draft communiqué has indicated. The government of Japanese Prime Minister Shinzo Abe, elected in December, has pushed the country’s central bank to adopt a much looser monetary policy, including a doubling of its inflation target, in order to help revive the country’s moribund economy. As part of the monetary easing policy, the Bank of Japan has also expanded its buying of assets. That has led to a weakening of the yen, which gives Japan’s exporters a price advantage, raising fears of a “currency war” – competitive devaluations by other big exporters. But George Osborne said the G20 communiqué would echo one adopted by the G7 earlier this week, which ruled out setting targets for exchange rates. Canadian Finance Minister Jim Flaherty said the communiqué would make it “quite clear… that everyone around the table wants to avoid any sort of currency disputes”.